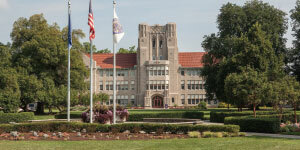 The University of Evansville is a liberal arts and sciences institution located in Evansville, Indiana. UE provides a challenging atmosphere with hands-on projects, high-quality teaching, and an academically rigorous curriculum. While the University is contained in only two city blocks, its reach is worldwide. More than half of UE students study abroad in countries around the globe—many of them at Harlaxton College, UE’s living-learning center in Grantham, England. Harlaxton is the hallmark of a robust study abroad program that was ranked #1 in the country by BestCollegeReviews.org. Since Harlaxton is owned by UE, students’ financial aid and academic credits are transferable, making it an affordable option as well as a practical one. Students can still stay on track to graduate in four years while also having a life-transforming experience abroad. UE’s curriculum is grounded in the liberal arts and sciences, thereby affording students a broad education that prepares them to enter the workforce with more experiences and knowledge than many of their peers. The Center for Career Development is staffed with passionate career counselors who work one-on-one with students to create professional résumés and compelling cover letters. Staff members also maintain closely connected relationships with businesses, both local and across the country, to help place students with internships and full- or part-time jobs. The center invites businesses to come to campus several times a year for networking events, including the Health Care Networking event, drawing 70+ businesses to campus to meet students. Students reap the benefits of these programs and more—which are offered at no extra charge to students and alumni. UE is proud to say that year after year, more than 90% of its graduates consistently find employment or placement in graduate school within months of graduation. Students at the University of Evansville can choose from more than 80 majors and 100+ areas of study housed in the colleges and schools on campus. Majors range from an award-winning Accounting program (rated #1 by Master of Finance Degrees) to world-class Business and Engineering degrees to programs such as Creative Writing and Archaeology. The School of Health Sciences at UE provides students with the programs needed to be successful in a variety of health professions. Students will graduate with the values, experiences, and skills they need to help others transform their lives through healthy behavior. Majors available include Athletic Training, Clinical Laboratory Science, Exercise Science, Health Services Administration, and both a bachelor’s and master’s degree in Public Health. Dedicated laboratory space is available for Health Science majors to learn and conduct research. In addition to the Human Performance Lab and the Athletic Training Lab, the Dunigan Movement Analysis Lab allows students to analyze human movement to provide a greater quality of life. Alumni from the School of Health Sciences are employed in a wide range of career fields. Graduates have gone on to careers as educators, public health specialists, coaches, and various positions with professional sports programs. Through a special partnership with the Indiana University School of Medicine-Evansville, UE’s Physician Assistant program will prepare students to enroll in the Master of Physician Assistant Science program. The PA program moved to the new downtown Stone Family Center for Health Sciences in fall 2018. This state-of-the-art multi-institutional campus will provide unique opportunities for interprofessional experiences among various health professional students, collaborative learning, and research opportunities. UE has developed several pathways for application and enrollment in the PA program that will work for a variety of students, regardless of where they are in their educational journeys. Detailed information about each pathway is available on the website listed above. Physician assistants are nationally certified and state-licensed health care professionals who provide direct patient care and work as part of a physician-led team in delivering a broad range of diagnostic, therapeutic, preventative, and health maintenance services. They work in diverse medical and surgical specialties, including family and internal medicine, emergency care, pediatrics, obstetrics and gynecology, general surgery and sub-surgical specialties, and mental and behavioral health care. PAs work in a wide variety of settings, including hospitals, clinics, physicians’ offices, and other health care facilities. UE’s Dunigan Family School of Nursing provides students with evidence-based, hands-on learning that begins freshman year. 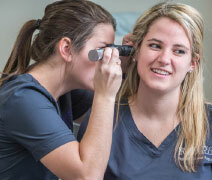 Students work with state-of-the-art technology in clinical simulations and gain experience in local health facilities. UE accepted applicants who meet the requirements can enter directly into the accredited Bachelor of Science in Nursing program and are eligible for the UE Need for Nursing Scholarship. They may be eligible for additional scholarships and financial aid. One hundred percent of all Nursing graduates are employed or enrolled in graduate school within six months of graduation. UE also offers an RN to BSN program for the working nurse. The program offers a competitive credit hour tuition rate, and students may qualify for financial aid.